On the Road to Damascus – Another Way? Has God ever interrupted your plans? You know, just when you think you are about to reach your goal, something happens and your entire direction changes. You end up with a completely different result than what you expected. The famous story of the Apostle Paul’s conversion in Acts 9 (and 22 and 26) shows one of the first century’s most famous conversions. On the road to Damascus the Christian persecutor Saul encountered Christ and became the “half-the-New-Testament-writer” Apostle Paul. All of us know the damage and the evil of ISIS. But we as followers of Christ are not without hope or a strategic response to this barbaric group. In this post, we invite you to join us on a brief journey into the Apostle Paul and pray with us some disruptive prayers for ISIS. Saul (later named Paul) struck terror in the hearts of early Christians. But he was changed on the road to Damascus. God still works “on the road” and “along the way” to where we think we are going. God has the power to show those in ISIS that there is another way, a better way. May God begin to stir with dissatisfaction the hearts of ISIS fighters, leading them towards an ultimate encounter with Christ. Saul was not just an average Jewish man. He was fully involved and zealous for his faith. Saul looked on with approval and even held the clothes of those who stoned Stephen, the very first Christian martyr (Acts 7:58, 8:1). May those who hold swords or knives or those who give approval to the murder of Christians realize the weight of their deeds; may they realize their zeal is misplaced. Damascus, one of the world’s oldest continuously inhabited cities (Varanasi is the other), was Saul’s destination for capturing and imprisoning Christian men and women. If Saul could rout them out from Damascus, he could protect the purity of his faith and advance the Jewish cause. May those who seek to expand their caliphate and who turn their eyes and hearts toward “strategic Damascus” have their plans disrupted. Following the religious law exactly, and “breathing murderous threats against the Lord’s disciples,” Saul obtained official mission papers from the religious leaders of Jerusalem giving him authority to arrest Christian men and women in Damascus. May the “threat-breathing” Muslims who seek to uphold the letter of the law of Islam, become passionate spokespeople for Christ to the very Muslim religious leaders who send others out on mission to persecute Christians. On the way to Damascus, Saul encountered the resurrected Jesus who appeared to him, spoke to him, knocked him off his horse, blinded him, recruited him, and instructed him on his next steps. May modern day “Sauls” see Jesus, call him “Lord,” and repent. May they instantly rethink their misguided theology, misplaced passion, and twisted religious practice. Inside the city of Damascus, God also worked on the Christians of the city. The disciple Ananias obeyed God and took a great risk to meet Saul, speak to him, lay hands on him, and heal him. May God raise up modern Ananiases who will speak with bold faith into the lives of many new followers of Christ from radical backgrounds. Paul (newly named) instantly began preaching and thus confused the Jews, who then began to plot his murder. This dramatic turn of events required Paul’s humble and creative sneaking out of the city in a basket. May God protect the young believers and inspire local Christians with new ideas for communication, travel, protection, and evangelism. Soon after his conversion, Christians in Jerusalem were still afraid of Paul, so God raised up Barnabas who stood up for Paul. May God raise up modern Barnabases who will courageously introduce former terrorists to the Church, and help disciple them. I am sure the biblical parallels and prophetic prayer requests can go on, so keep digging in Scripture and interceding for those who are zealously persecuting the Church. God may again interrupt and surprise us all. ISIS recently stated, “Accept the fact that this caliphate will survive and prosper until it takes over the entire world and beheads every last person that rebels against Allah. This is the bitter truth. Swallow it.” Yet, despite the murderous threats, God moves in this region of the world. 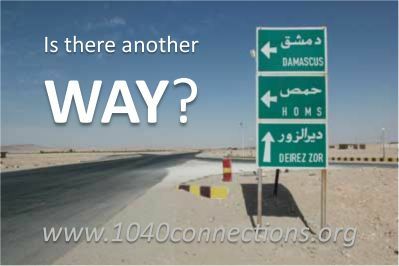 Yes friends, another way exists, an encounter with Jesus – even on the road to Damascus.